Hugh Jackman Says he Will be Wolverine "One Last Time"
Hugh Jackman posted a picture of the iconic Wolverine claws with the caption "Wolverine ... one last time". Just after a month since stating he wanted to be Wolverine forever, Hugh Jackman is now suggesting that his next appearance as the popular X-man will be his last. 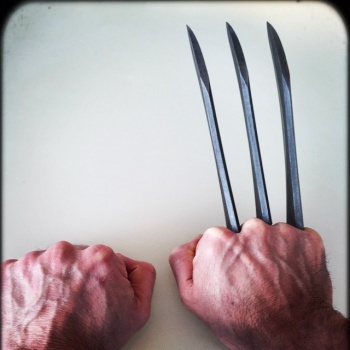 The actor recently posted the image you'll see to the right of Logan's famous adamantium claws on his official Instagram account. It was accompanied with the caption ""Wolverine ... one last time". The three claws suggest that he is talking about the upcoming third Wolverine stand-alone movie, which is slated for release in 2017. While the message could interpreted as Jackman's last time playing the character, another way to look at it may be an announcement that this would be the last stand-alone Wolverine movie. Either way, at this point we are unsure of whether or not Jackman will appear in the upcoming X-Men: Apocalypse due out next year. We have, however, learned that Patrick Stewart and Ian McKellan won't be reprising their roles as Professor Xavier and Magneto, so this information, combined with Jackman's cryptic message, suggests that Wolverine won't be in it. When Wolverine 3 is released, it will mark Jackman's 17th year playing the character, since he was first cast in 2000's X-men. What do you think? Should Jackman's Wolverine continue, or is it time to hang up the claws?